This stylish wedding gown with a hint of retro is perfect for those of you not afraid to stand out. The décor in the form of imitation pearls on the back of the gown is both stylish and chic. The straight-across neckline is an all time classic, and the lace insert adds a romantic touch. The drop waist corset highlights your figure in all the right places, and the flared skirt with a train turns every move you make into a majestic stroll. 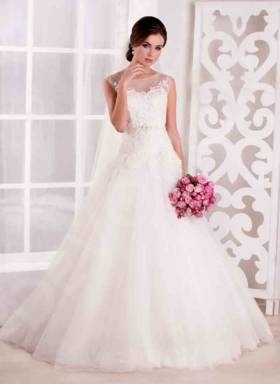 Be a bride of unparalleled beauty in this gorgeous gown.